Alice Palace in the magazines! Lots of new designs for Valentines! Alice Palace has got some brand new Valentines cards - to be launched at Top Drawer Spring, just in time for expressing your love to that someone special! Traditionally, spring begins on St Valentine’s Day, the day on which birds chose their mates, so to mark this tradition,‘You’re the one for me’, a beautiful illustration featuring a little bird (which is suitable for sending to both men and women alike) is one of the new designs. YEY - the eggnog latte’s are back and I had my first one of 2009 on Saturday - yummmmmmmmmmmmmmmmmmmmmmmmmmy! After a fun night full of homemade pizzas and gin & tonics with Katie and Matt, Lizzy picked me up on Saturday morning and we set off for Hereford to go along to the contempoary craft fair. It was really good and I made a few purchases including a ‘hello lovely’ greeting card, a mug (i love), a Christmas decoration, and I even managed to get a great Christmas present for myself from Liz! This squirrel had a near miss (and had a moment to reflect on his life) after Jemima came very close to catching him yesterday morning…. phew! Our Mr & Mrs apron is included in the Not on the high street mail out for personalised and practical gifts - we’re selling LOADS of them!!! We caught the end of the fireworks display in Evesham, after getting distracted by pints at the pub and putting on wellies! 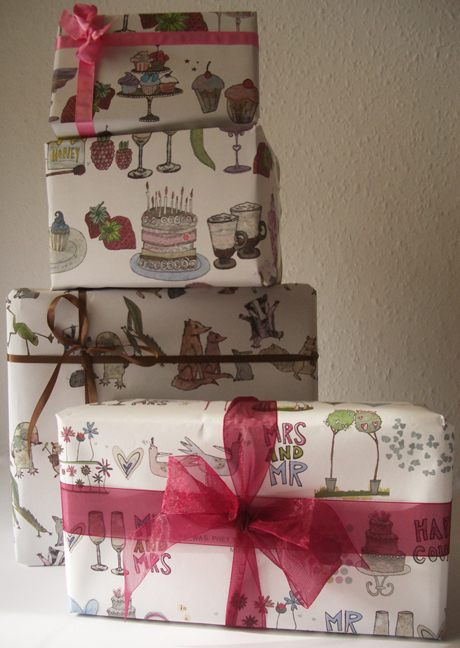 It’s easy with the new Alice Palace wrapping paper!